The cabinet in question. The doors and shelves are original to this 19th century house, while the backs and sides were built 12 years ago by a local carpenter. Shall we have a peek inside? I transferred the cabinet’s contents to the long counter below. Do I have room for it? 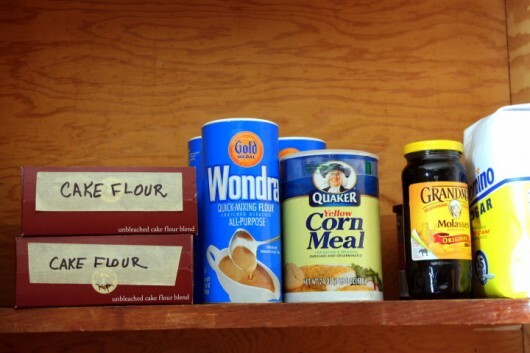 Out went the small remnants of “specialty” flours, and bottles of various condiments I will never use. I also chucked several bottles of wine that had been opened, sipped, re-corked, and forgotten. And did I really need a package of cupcake wrappers when I so rarely make cupcakes? I gave the wrappers away. The good booze was transferred to the “good booze” cabinet in my pantry. 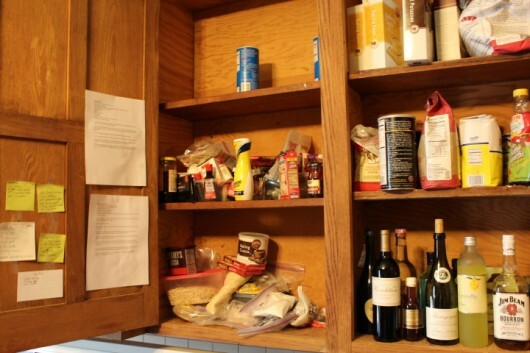 (I now have room for all kinds of things in the pantry, because I recently deep-cleaned it.) The gin hopped into the freezer, where it rightfully belongs. I used tubs and trays to corral small bottles of extracts and other easily-lost items. 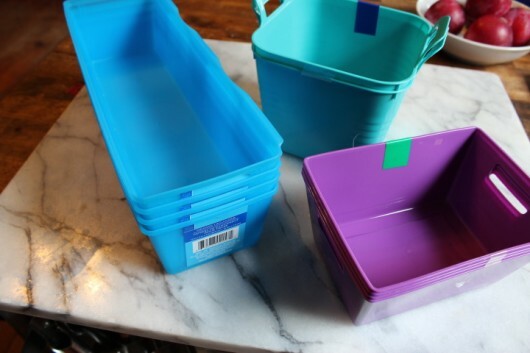 You can find such containers at any hardware (or “dollar”) store. Good news: Two hours and several trash bags later, I had plenty of room for an honest baking center! 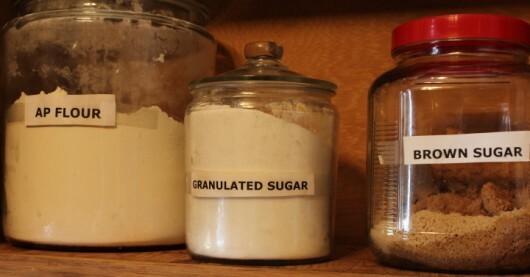 Because I use them almost daily, I put the jars of all-purpose flour, granulated sugar, and brown sugar on the first shelf behind the left door. 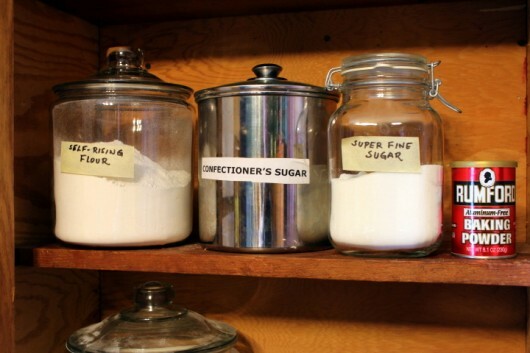 On the second shelf, and also within easy reach, are jars of self-rising flour, confectioners’ sugar (or confectioner’s sugar, as I labeled it), super-fine sugar, and a can of baking powder. Tip: Never store baking powder over a stove. The heat will render it inactive in very short order. On the top shelf, which is only accessible when one is standing on a chair, are the less-frequently used baking supplies, plus an extra bag of granulated sugar. The boxes of cake flour are labeled in big print just to catch my attention. No more hunting for the vanilla! On the lowest level of the second cabinet, I contained all of my extracts in a long blue tray, along with the packets of unflavored gelatin I use for Panna Cotta. Also close at hand are the bags of almonds and dried fruit that I use for granola. The tub labeled “well-baked beans” contains the “pie weights” I use when blind-baking tart shells and other crusts. 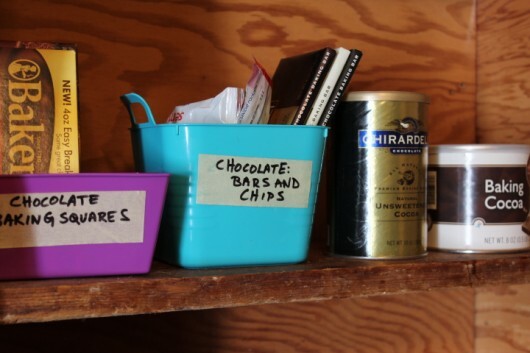 The middle shelf is devoted entirely to baking chocolate — bars, chips, and powders. Obviously I take chocolate desserts very seriously. Out of easy reach on the top shelf is extra baking soda, plus Japanese-style breadcrumbs for my croquette-making adventures, and tapioca granules for thickening rhubarb and other “runny” pies. Of course, these aren’t the total sum of my baking arsenal. I store a small ramekin of kosher salt in the top drawer of my work station, and myriad jars of herbs and spices in a nearby cabinet. And speaking of herbs and spices! It’s hard to find room for these, especially if you keep acquiring them, as I do. If you have a tidy herb-and-spice storage solution, by all means talk to me in the comments field below. 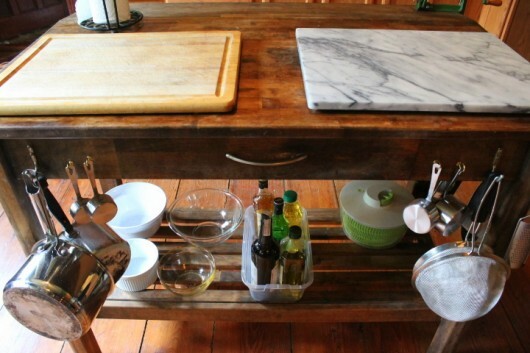 Well, I hope this post was of some little value to you, and that you feel empowered to deep clean your own kitchen cabinets and drawers. After all, cooking is much more fun when you can easily grab the ingredients you need! 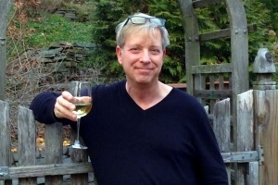 Don’t miss anything at A Garden for the House…sign up for Kevin’s weekly email updates! I would love to see your recipe for home made granola! Great minds must think alike because I just finished cleaning and sorting my pantry and cabinets too. I did toss a few things I also put some stuff aside to take to the food pantry later. As for spices, I tend to hoard I mean accumulate them as well. I store them in baskets. The ones I use all the time are in the open shelves by the work counter. The basket works like a drawer. I just pull it out to get to them. The rest are in baskets in a cupboard sorted by use… baking in one basket, cooking spices in another. You have inspired me to deep clean and organize my cabinets! Nice job! I’m lucky to have 10 apothecary-style drawers beside my work counter and store my herbs and spices there, in, well, roughly alphabetical order. I try very hard to date the containers so I know when they are stale and need replacing. And I refill from larger continers in the freezer, which keeps them fresher, or at least I think it does. Salt is in a covered wooden container on the counter beside the pepper mill. But my baking supplies are a hot mess. Hmmmm…another rainy day project to add to the list. Thanks Kevin! I store my baking spices in a drawer in my baking center. They lay flat and are easy to read. The cooking spices go in the cupboard near the stove so I can grab them when I need them. My theory is spices in the correct center. I thought I was the only person who stuck mismatched paper notes all over the insides of my cabinet doors. Once again, you have normalized me. Thanks for revealing! My favorite organizing tool for the baking supplies is a lazy susan. I have two lightweight plastic lazy susans holding spice bottles, extracts, cupcake papers, toothpicks and the like. The contents are divided roughly into sweet and savory uses. Both are near eye level and allow me to browse easily. I use cupcake papers to hold sticky brownies, lemon bars, homemade candies, etc. when serving those at a family party or giving as gifts and boxing them up. The cupcake paper seems to indicate “one serving” and rein in the gluttons, not that I know any. I have to say that my lazy susan is the best for storing the spices. I stack short spice cans on top of one another on the top layer. Bottles on the bottom. If I have duplicates I put those behind the ones on the outside ring of the turntable. I enjoy your site! My Cabinets look like, hard to describe, a “Ruff-Tumbled- Mess”. You gave me a project now to start next week. Hopefully I have a little more room then. You know how they say the design of a house shapes the people in it? Well, I now see how that is true, in at least one way, for me. I live in a turn of the century Victorian where an ironing cabinet was installed in the kitchen. It is a long cabinet with a drop-down ironing board. When I purchased the house, the ironing board was gone, but little shelves had been installed to replace it. It Is not a deep cabinet, but it is especially good for my herbs and spices. I think because I found so much room, I began to acquire or grow herbs to fill it, or was it the other way around? I love to cook and bake, so I filled it with herbs? Anyway, it is a great space for herbs and takes up no room at all. I can’t imagine how I would store and find all my herbs and spices without it. Here is the contact for the company that made my spice rack. I need another one since I like to make spice blends to have on hand! I made a photo of it but I can’t upload it here. You’ll get the idea as soon as you look at the site. A few years ago I had an ant infestation that caused me to clean out my baking cupboard. I now have everything in their original contains but inside ziploc bags. It stayed neat for awhile – but now its over crowded and disorganized. You are inspiring me to get it all cleaned out again. I also realized the other day that I have an entire double cabinet (3 shelves) dedicated to herbs and spices – and vinegars and oils. Not sure how that can be possible, but glad I at least have the space to dedicate to it!! Love your pantry! If your house is as old as mine, I wonder if you have the old built-in ironing board ‘cubby’? Mine is the most perfect depth for all kinds of spice containers and goes from ceiling to floor. This was probably before your time kiddo, but you may have seen a picture – the board folds up and back into the cabinet – someone before me built shelves in mine. It is great!! I loved the photos and comments! I laid a 2″x4″x18″ (width of my cupboard) piece of wood on the back of my shelf and placed the larger containers of spices on it so that they would be elevated and I could still read their labels after I put other spices on the shelf in front of them. I also purchased at Wal-Mart a stair-step style spice rack for my smaller containers of spices. Lazy Susans! I have several in my cupboards. I usually try to pick them up for a quarter or 50cents at tag sales whenever I see them. Can’t have too many in my opinion! I too, use several turntables and store my spices in alphabetical order . A shallow pull-out drawer under my stove-top (usually used for pots and pans) holds all my jars of spices and herbs. The tops of the jars all have a handwritten label (labor intensive the first time around) so I can easily find the specific jar I’m looking for. Refilling only as much as I may use in less than a year (from bulk at the Good Food Store), keeps them fresh. I currently have about 80-90 jars in there– this method with lid-labels has worked well for me. I’m short, so almost everything is below eye level. I store my spices standing up in a drawer that is just deep enough. I label the tops and keep them more or less alphabetical . I have a lazy Susan corner cupboard and some deep drawers in my baking corner. I don’t even need to lift my flour barrels out to scoop what I need. I store my baking powder in the frig. it keeps longer. oh and I love the way you organized your baking center.i wish I had the space. I noticed that you have brown sugar stored in a jar. Do you find that works out well? I have tried so many ways and recently noticed the Tupperware container I had some in was starting to smell moldy! Not happy about that…..
Kevin, I deep clean the pantry every 6 months. I don’t buy jar spices, only bulk at the organic store. They are fresher, and a fraction of the cost. The seldom used herbs I get about 3 tbls. worth. The most used I buy at least 1 cup worth. They are in tiny zip bags and I have in a very narrow wire container I got at The Container Store. Similar to your DK. Blue. I then make “blends”. I put all the “Italian” herbs together, the “French”, Asian, and Grilling. These I keep in sm.glass jars I bought at Pottery Barn. It’s so handy and I seldom get waste or stale herbs and spices. I make my own “Self Rising” flour so I don’t end up tossing that from non-use. You can also substitute cake flour in a pinch. AP sifted to a fine powder, usually 4 sifts will do it. Living in the horrendous heat of Texas, we must use things quickly or they will get ravaged with pesky bugs. I vacuum seal everything not used regularly. 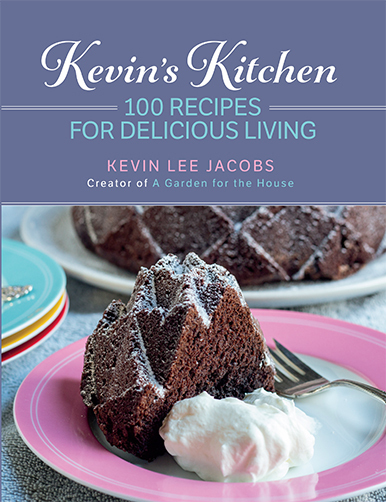 Kevin, love your posts and recipes!!!!!!!! Wish I had a big kitchen again to store all of my stuff. The guy that built it didn’t design it very well and have 3 cookie sheet cabinets, no room for a dishwasher, 2 corner cabinets where everything slides all the way back to the wall and no toddlers in the house to retrieve stuff!!!!!!! !LOL We need to win the lottery to redo the kitchen. Like a previous reader, I also hoard spices, but I keep mine in a big freezer and just keep out a small amount of the ones that are used most often. Have not noticed any in the freezer that have lost strength. I also grow fresh herbs and also dehydrate some for winter use. Thank you for information about baking powder by the stove. Did not know that. Will have to rethink where to put it. I keep all flour except the white(used most often) and extra sugars in the freezer. I love your beautiful baking centre, so organized and efficient. Very inspiring. As for spice organization ideas I will pass on what my mother-in-law does because her arrangement is very efficient as well. In every house that they have lived in there has been a small closet in the kitchen I believe it is meant to be a broom closet. But she gets my father-in-law to install shelves in the closet and that becomes her spice closet. She keeps things in large labeled jars, no little herb bottles are welcome. She gardens as well so she has a lot of dried herbs from the garden. It is a lot easer to keep these things in larger jars like mason jars. It works very well and she has all the room she could want for spices and herbs. I admit that I haven’t read all of the comments entered, so I hope this question isn’t already answered. 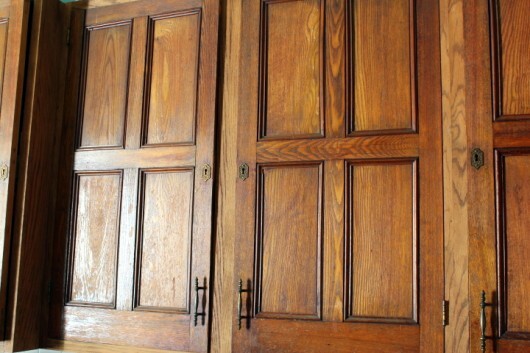 I have cherry cabinets and would love to know how you cleaned the doors to your cabinet? Also, I purchased a container of the Wondra flour for a recipe and haven’t used it since. How do you use it? Your site is great, in my next life I’m going to be like you! I store my bottles of herbs and spices in a deep drawer, savory on the right side, sweet on the left, extracts at the back, and every day things at the front. When I get a new jar, I write the name of the contents in neat block letters on the lid. A Sharpy works well for most, and an old silver paint marker works well for the dark lids. Voila! Since my children have grown and left home I have learned to DATE all my pantry items when brought from grocery shopping trips. Yes, they have expiration dates but this is more visible and reminds me easily which pkg. of same items should be used next. Just this morning I put my organic brown sugar into a tight sealing glass container since the zip-lock back that it comes in doesn’t close well after starting the bag – you know sugar granules clog up the zipper. Excellent solution. I’m a retired school librarian, so I bought a beautiful antique card catalog to use as part of a kitchen island. (Our excellent carpenter backed it with a matching cabinet with big drawers and topped the whole thing with a marble slab) It is old enough to pre-date “modern” card catalogs (all outdated now!) with 3″x 5″ drawers; mine has Harvard style 2″x5″ drawers which perfectly hold the square jars I found from specialtybottle.com. The square jars don’t roll and have flat sides for labels. Of course, they are in alphabetical order! My trouble is that I normally don’t buy my spices in those small bottles, except for some I rarely use – I bulk buy from the local Indian grocer as it’s so much cheaper. For example I recently got 100 x 10cm long cinnamon quills for A$5, compared to A$4 for 8 in the supermarket. This does create a storage issue though as everything needs to be in either jam jars or worse (larger) in preserving jars. Two shelves of my pantry are taken up with spices. But somehow I don’t care – I love having fresh herbs and spices to cook with. Oh and I forgot to mention – the tomato tart looks great. All it needs is a few pieces of goat cheese crumbled over it. Nice job. Do you make house-calls? I store herbs and spices in separate plastic bins – 2 bins for each category in a cupboard above my work surface. 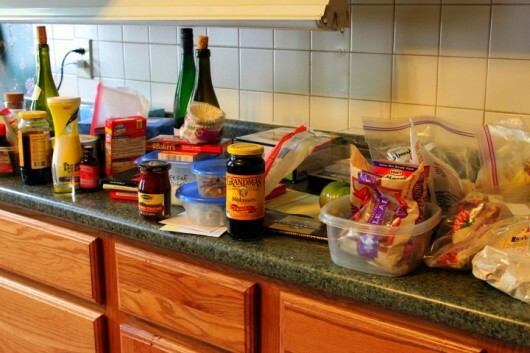 I also alphabetize the contents for easy retrieval during cooking/ baking. (overkill???) The bins are about 5-inches high so the little jars or tins don’t tumble out when I lift the bins down from the upper cupboard and, of course, they are washable! BTW – Can’t wait to try this recipe with Jersey Fresh tomatoes – now in season! I am inspired to clean out my spice and herb collection. I love to use them but two deep drawers and a 5 shelf cabinet is way too much. Today I will pull everything out and “ruthlessly” toss out what is not used or too old. Also, I have 4 and 6 ounce recycled glass jars with corks that will be used for my herbs I grew and dried this year and will be limited to one jar for each herb. Thanks Kevin!!! I have found the perfect answer for all my spices. I have a very large drawer next to the sink where I keep all spices. I have marked the top of each jar so there is never any guessing, when I look down into the drawer, as to which bottle contains which spice. I have shoe box sized cardboard boxes in the drawer to divide and organize the many bottles. I bake and do lots of Indian cooking so I keep a large assortment of herbs and spices on hand. The solution I found years ago to being able to find my herbs and spices easily is to put them in clear shoe boxes in the pantry. 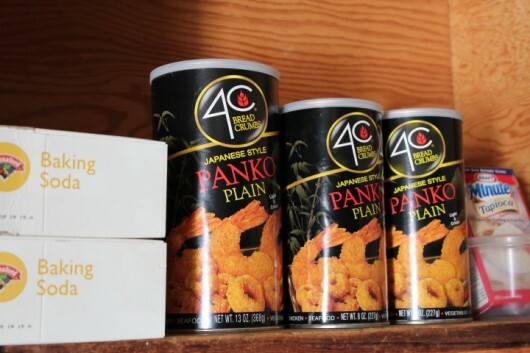 I put the letters (i.e., “A – F”) on the end of each box showing what is in each container. This is an easy size to get from the shelf and find what is needed. The Pumpkin Pie Spice is, for instance, in the box that included the “P’s” in the letters on the end. When I buy in bulk, I put the item in a previously purchased bottle of the same herb/spice (that’s been used up) if I have it. I put the date on anything I buy for the obvious reason. I know this comment is a little late but after searching for years, I have finally come across the ideal herb and spice solution. 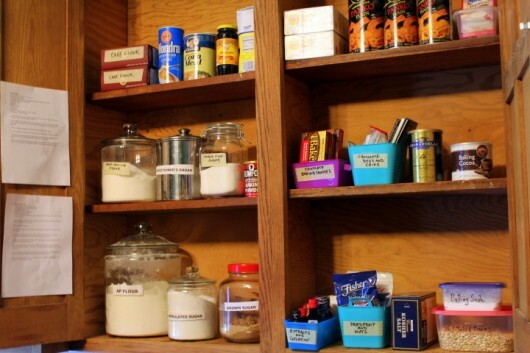 I have over 120 herbs, spices and blends so they take up a lot of pantry space and were very messy and hard to find. I invested in a 4 drawer wire rack, a lot of Tupperware spice containers and an old-fashioned Dymo label-maker. 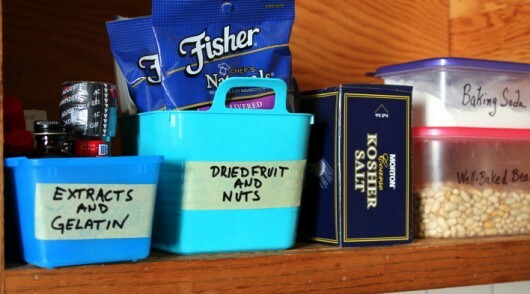 The containers are stored in 3 drawers, each with a neat label on the top. (The bottom drawer is very handy for my onions and potatoes – in a potato bag of course). One drawer has curry spices, one drawer has herbs and the third has the blends and any spillover from the top. I also have two wire racks on the back of the pantry door that hold those spices that I buy in bulk – cumin, coriander, dried garlic, sweet paprika, and so on. Finally I’m happy with my spice organisation! I store my 100 plus herbs and spices in a cabinet that was originally the pantry cabinet in this 100 yr old plus house…They might have used it for table linen at one time also. It’s from floor to ceiling. Top is for puzzles and board games the rest is my herbs and spices. Has a door on it so that helps. Eileen read my mind! I was going to ask for your granola recipe, but now, I shall simply use the one you thoughtfully supplied to this lovely lady. P.S. Have you done a session on how long various spices keep? I have some pretty dodgy looking tins in my spice drawer but don’t want to throw them away if they are still okay.